LAS VEGAS (Reuters) - U.S. President Donald Trump gave a full-throated endorsement to his embattled Supreme Court nominee Brett Kavanaugh on Thursday and tip-toed carefully around the sexual assault accusations that are facing him. At a rally in Las Vegas, Trump appeared with Republican U.S. Senator Dean Heller of Nevada and offered strong support for him in his tough re-election battle against Democrat Jackie Rosen in November congressional elections. "Brett Kavanaugh, and I’m not saying anything about anybody else, Brett Kavanaugh is one of the finest human beings you will ever have the privilege of knowing or meeting," Trump said. "So we'll let it play out, and I think everything is going to be just fine. This is a high quality person," he said. Speaking to Fox News anchor Sean Hannity prior to the rally, Trump addressed the Democrats' demand for an FBI probe into the Kavanaugh accusations, questioning why the FBI was not notified "36 years ago" when the incident allegedly occurred. 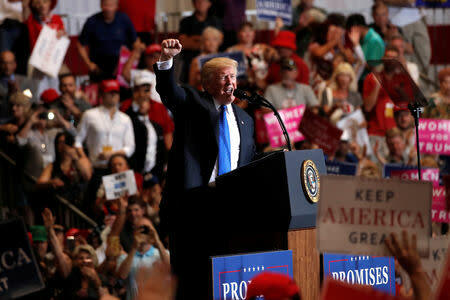 With Republicans fearful that Democrats could wrest control of the U.S. House of Representatives and even the Senate from them in November elections, Trump urged his supporters to get out and vote for the party's candidates, saying the economic measures he has put in place could be hanging in the balance.